One week ago it was David Bowie's 67th birthday. One year and one week ago he took the whole music world by surprise when, after years of radio silence, he unexpectedly released an unpromoted new single "Where Are We Now?" and also announced a new album, first since his 2003 record Reality. Considering it had been ten years since his last studio album and his last concert had been in 2006, he was believed to have retired. As you might imagine, the world went crazy - the chameleon of pop, the Thin White Duke was back! It's not easy to make a believable comeback after such a long hiatus, especially with a back catalogue as extensive as Bowie's. People's excitement tends to build up and form impossibly large expectations with such iconic artists, which is perhaps the very reason why the artist executed his comeback unannounced, writing the album in secret. The artist has to prove that he or she is still relevant, making new excitingly fresh music that doesn't recycle the same old pattern but also without alienating previous audiences. What a tough thing to do. Remember when I wrote about Grace Jones's stellar Hurricane? She certainly pulled it off - and after a recording break of 19 years, mind you. But what about Bowie? Let's start from the very basics - the artwork. It obviously recycles the easily recognisable album cover Bowie's 1977 LP Heroes, the second album of his Berlin Trilogy. It looks like it's edited with MS Paint: there's a big white box with the words "The Next Day" written on it, with the previous album title clumsily stricken-through. Uh-oh - is the whole album going to be as referential as its artwork? Sure, there are nods to the Bowie's past - take the Berlin-referencing lyrics of "Where Are We Now", for instance: "Sitting in the Dschungel / On Nürnberger Straße / A man lost in time". Although I must admit, I'm not the hugest fan of his so many references might go unnoticed by me. I do very much acknowledge his iconic status and legacy as a pioneer of rock music, and like The Beatles, he is one of those artists whose material you're just supposed to be familiar with, especially if you write about music. But just like with The Beatles, I've tried to listen to his albums without the music really speaking to me. For that reason I kind of deemed the media hype aroused by his unanticipated comeback off as nothing but music journalists desperately trying to be hip and knowledgeable. That is until I gave the album a spin. I was instantly hooked. This wasn't the Bowie I had previously tried to listen to. This sounded fresh and... accessible? This doesn't even remotely sound like a former legend trying to dust off the mold and be relevant once again - this sounds like a legend coming back like he's never been absent to begin with. The album opens with the catchy uptempo title track "The Next Day". Although the lyrics apparently describe hypocrisy ("They can work with Satan while they dress like the saints / They know God exists for the Devil told them so") and the corrupting effect of power, it can also be interpreted as an ironic jab at people who expected him to be gone and forgotten: "Here I am, not quite dying / My body left to rot in a hollow tree". Things slow down with the saxophone-led mid-tempo "Dirty Boys", before picking up the pace again with the excellent "The Stars (Are Out Tonight)", whose lyrics describe the terrible mess that is fame and people's obsession with and idolisation of celebrities. The song is dramatic and melancholic and stands out as one of the best tracks on the album. What is truly astonishing about the album is the fact that no two songs sound alike and yet, fit together so seamlessly. Furthermore, there is not a single track that would have a fillerish feel to it - each song is strong enough to justify its existence on the album. The Next Day is not the briefest of albums - it clocks at 53 minutes and 17 seconds - but it never gets boring or repetitive. The songs are infectious and the lyrical content meaningful; the otherwise beautiful "Valentine's Day" for example is about a high school shooter, whereas "I'd Rather Be High" is Bowie's anti-war statement in the form of a story told by a young man of seventeen who's got plenty of other things he'd rather do than participate in the war he's sent to serve in: "I'd rather be high / I'd rather be flying / I'd rather be dead or out of my head / than training these guns of those men in the sand". As I mentioned above, the album is quite complex what it comes to the musical style. There is not a definitive track that would crystallise the soundscape here, which is a brilliant thing. While a total of five singles were released from the album ("Where Are We Now? ", "The Stars (Are Out Tonight)", "The Next Day", "Valentine's Day", "Love Is Lost"), it's not a singles-oriented album but truly an album meant to be listened to as an album. It's rather sad how the concept of an album seems to have lost importance during this digital era where the songs can easily be downloaded separately and then gathered into arbitrary playlists consisting of a bunch of other songs. Therefore it's especially good to have albums like this were the tracks do arguably work well independently, too, but ultimately shine brightest when listened to as an entity. From "Love Is Lost" and its theatrical organs to the frenetic "If You Can See Me", The Next Day sees Bowie experiment with a range of styles. "Dancing Out In Space" feels almost silly in its poppiness, while the album closer "Heat" is a surreal number whose synth-laden retro-futurism brings slightly to mind the soundtrack of the 1982 sci-fi classic Blade Runner. "(You Will) Set The World On Fire", one of the most memorable tracks, has Bowie singing about a music star who's not afraid to speak her mind which will get her into trouble: she's "screaming like a Banshee" (note: in Irish mythology, a Banshee is a creature that announces someone's impending death but doesn't cause it - similarly, the woman of the lyrics only addresses problems caused by others, but due to breaking taboos, is condemned for this) and consequently she's told that "You will set the world, babe / You will set the world on fire". Bowie does also get mellow on this album. "You Feel So Lonely You Could Die" is a beautifully tragical number which also samples the drum beat from Bowie's 1972 song "Five Years", bringing a hint of nostalgia. And speaking of nostalgia, there's "Where Are We Now? ", the lead single that marked the his comeback. The heartfelt song is a bit of a grower: the first time I heard it I wasn't too impressed but the more you listen to it, the more emotional it gets. The wistful tune is also probably the most retrospective one of the bunch, with Bowie apparently reminiscing his Berlin times, rhetorically asking "Where are we now, where are we now?". (Well, still in the forefront of rock music, even after nearly 50 years in the biz, that's where.) The nostalgia and the referential name-dropping on the album aren't superfluous, though, and feel justified for someone with such a long journey in the music world. 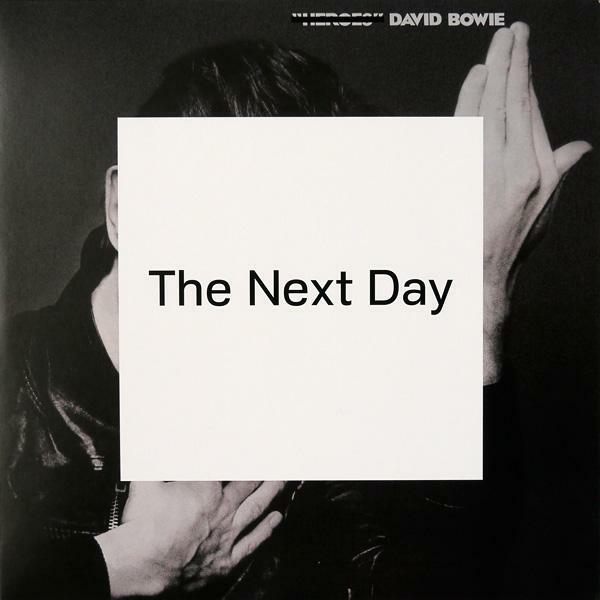 So all in all, The Next Day does not necessarily see Bowie reinventing the wheel, but at the same time it's a most exciting and solid album, with a soundscape broad enough to keep the listener intrigued throughout its 53-minute run. And whereas I might not be that familiar with his material, fair enough - I never could bring myself to listen through any of his "legendary" albums, ashamed as I am - I'd say that this is definitely on a par with his earlier work. (If not even better.) Now I'm slowly starting to see what the hype was all about: not only is The Next Day indeed a brilliant album, it's also one hell of a comeback. From Bowie to Beyoncé, year 2013 was a year of stealthy album releases but as far as I'm concerned, the former Mr. Stardust was single-handedly responsible for the best album of the year. There, I said it. The best album of the year 2013. Try at least: "The Next Day", "The Stars (Are Out Tonight)", "(You Will) Set The World On Fire"